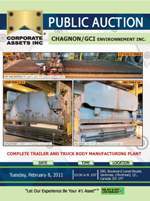 Corporate Assets Inc. | Chagnon/GCI Environment Inc. - Corporate Assets Inc. FEATURING: MG INDUSTRIES (1996) MP 17’ X 61.5’ gantry style CNC plasma cutting system, CINCINNATI 1000 ton 22' hydraulic press brake, ALLSTEEL 400 ton 16' hydra mechanical press brake, WEBB 7L-1 initial pinch plate bending rolls, PULLMAX Z33 angle bending roll, GANTRY TYPE TANK WELDING CELL, PROMECAM GH12302 hydraulic shear, SCOTCHMAN 85 ton hydraulic ironworker, PIRAHNA 50 ton hydraulic ironworker, HYDMECH S25A horizontal band saw, GROB (1980) 4V-24 vertical band saw, GULLCO portable plate edge bevelling machine, W.A. WHITNEY 90 ton C frame hydraulic punch, PANDJIRIS 10 ton cap tank turning rolls, 65’ X 25’ X 32’H shot blast room, 60’ X 20’ X 29’H paint booth, 60’ X 18’ X 29’H paint booth, GROVE 12 ton hydraulic boom crane, SCHAEFF (1999) SKL 833 articulated wheel loader, (3) large dust collect systems, over 65 welders, Large selection assorted tubes, angles, plate steel, I beam etc., 25) LISTA tool cabinets, GULLCO 350 rod oven, GULLCO 1000 rod oven, welding supplies, transmission stands, assorted jacks, lifting accessories, belt sander, hydraulic pumps, drill presses, mag drills, lifting magnets, (15) torch sets, parts washer, pedestal grinders, hand & power tools, inspection equipment, spare parts inventory, work in process, office furniture, computers, business machines and more.